What is the HLOOKUP Function? HLOOKUP stands for Horizontal Lookup and can be used to retrieve information from a table by searching a row for the matching data and outputting from the corresponding column. While VLOOKUP searches for the value in a column, HLOOKUP searches for the value in a row. How to use the HLOOKUP Function in Excel? The next step would be to give the table array. Table array is nothing but rows of data in which the lookup value would be searched. Table array can be a regular range or a named range, or even an Excel table. Here we will give row A1:F5 as the reference. Next, we would define ‘row_index_num,’ which is the row number in the table_array from where the value would be returned. In this case, it would be 4 as we are fetching the value from the fourth row of the given table. Suppose, if we require marks in Economics then we would put row_index_num as 3. The next is range_lookup. It makes HLOOKUP search for exact or approximate value. As we are looking out for exact value so it would be False. The result would be 72. Here, HLOOKUP is searching for a particular value in the table and returning an exact or approximate value. It is a case-insensitive lookup. It will consider, for example, “TIM” and “tim” as same. 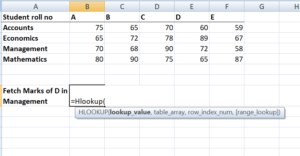 The ‘Lookup_value’ should be the topmost row of the ‘table_array’ when we are using HLOOKUP. If we need to look somewhere else, then we must use another Excel formula. HLOOKUP supports wildcard characters such as ‘*’ or ‘?’ in the ‘lookup_value’ argument (only if ‘lookup_value’ is text). Let’s understand this using an example. The wild character used is ‘*’. 4. #N/A error – It would be returned by HLOOKUP if ‘range_lookup’ is FALSE and HLOOKUP function is unable to find the ‘lookup_value’ in the given range. We can embed the function in IFERROR and display our own message, for example: =IFERROR(HLOOKUP(A4, A1:I2, 2, FALSE), “No value found”). 5. If the ‘row_index_num’ < 1, HLOOKUP would return #VALUE! error. If ‘row_index_num’ > number of columns in ‘table_array’, then it would give #REF! error. 6. Remember HLOOKUP function in Excel can return only one value. This would be the first value n that would match the lookup value. What if there are few identical records in the table? 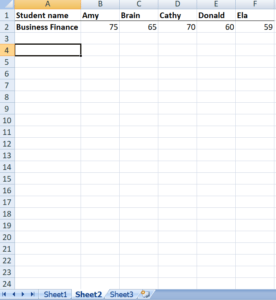 In that scenario, it is advisable to remove them or create a Pivot table and group them. 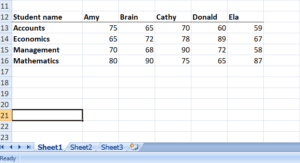 The array formula can then be used on Pivot table to extract all duplicate values that are present in the lookup range. Then we will drag it to the remaining cells. So far, we’ve used HLOOKUP for a single value. Now, let’s use it to obtain multiple values. If you wish to get an array, you need to select the number of cells that are equal to the number of rows that you want HLOOKUP to return. After typing FALSE, we need to press Ctrl + Shift + Enter instead of the Enter key. Why do we need to do so? Ctrl + Shift + Enter will enclose the HLOOKUP formula in curly brackets. As shown below, all cells will give the results in one go. We will be saved from typing the formula in each cell. Check out CFI’s Free Excel Course if you want to learn more about Excel functions using your own online instructor. You’ll receive step by step instructions and demonstrations on how to become an expert in Excel.